This island in the southwestern Cyclades is 150km southeast of Athens, and separated from its neighbor and historic rival, Milos, by a 1km-wide strait off its southwest coast. Kimolos is roughly circular in shape, with a diameter of about 7km. The entire northeastern quarter of the island is a mostly uninhabited wildlife refuge, and home to a monk seal colony which lives in and around some seaside caves. There’s only the one village on Kimolos, the inland settlement of Horio. Along with its port, Psathi, and a smaller seaside settlements of Groupa and Kara, all within 600m of each other and arguably part of the same “metro” area, Horio accounts for most of the island’s population of 600. Despite a recent increase in tourist trade, the island’s population has been steadily eroding, with its mostly elderly year round residents spending the lonely, rainy winter months there. School records show only about 100 school-age children. The name “Kimolos” comes from “kimolia,” the Greek word for “chalk,” because of the island’s whitish rock. A lot of the coastline resembles a mini version of the white cliffs of Dover. This mountainous island has many caves and some very interesting geological features. Kimolos is rich in rare earth and minerals, and is a source of perlite, the white, ultra-light volcanic rock used which is the white flecks you see in potting soil to aerate it. Greece, by the way, is the world’s largest producer of perlite. Perlite can also be used in making lightweight concrete. The perlite mine in Kimolos is in the extreme northeast corner of the island, and one of the island’s chief employers. If you look at a satellite image of Kimolos on Google Earth, you’ll see the mostly mottled earth tones of the island, and then, up in the upper right hand corner, this large, brilliantly white splotch about 750m long and 500m wide. That’s where the perlite is mined. Kimolos is nowhere near the popular tourist destination Milos is, and for that reason offers an opportunity for you to spend some time far from the madding crowd, in splendid isolation on its pristine beaches, but with a more crowd-friendly alternative just a few minutes’ boat ride away. 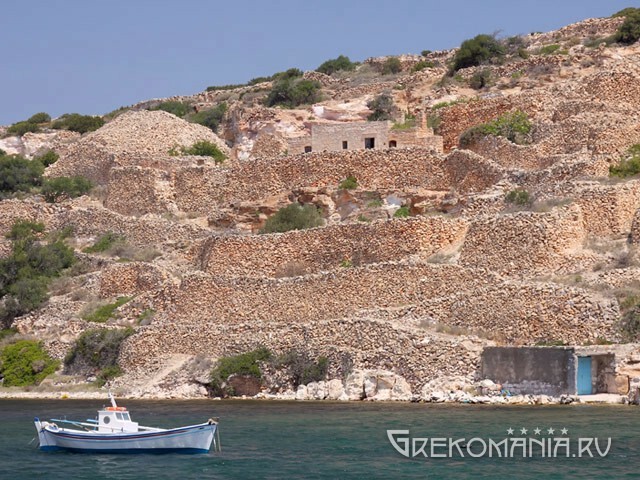 Kimolos is a fishing/mining/farming island, with a bit of tourism thrown into the mix. Any sun, sea and seafood-filled stay there passes smoothly and peacefully, and very likely will leave you wanting to come back again and again. We don’t have a lot of details, but we do know that Kimolos has been inhabited since the Late Stone Age. Kimolos, like a lot of places in Greece, has an origin story rooted in mythology. In the case of Kimolos, it was supposedly named after its first inhabitant named, appropriately, Kimolos. He married Side, who was a daughter of Poseidon, god of the sea. Side was named after the Greek word for iron (sideros), and was associated with iron, minerals, and semi-precious stones. This is mythology’s explanation as to why Kimolos is so rich in mineral deposits. In classical times and later, Kimolos was the site of a proxy war between Athens, who ruled it, and Sparta, who ruled Milos just next door. The island’s history is a bit sketchy, but resembles that of the other Cyclades, with a succession of rulers including the Byzantines, Venice, and then the Ottoman Turks, from which Kimolos and the other Cyclades were annexed by the newly established modern Greek state in 1829. Today Kimolos offers some very nice beaches, lots of seclusion, and some incredible geological phenomena. 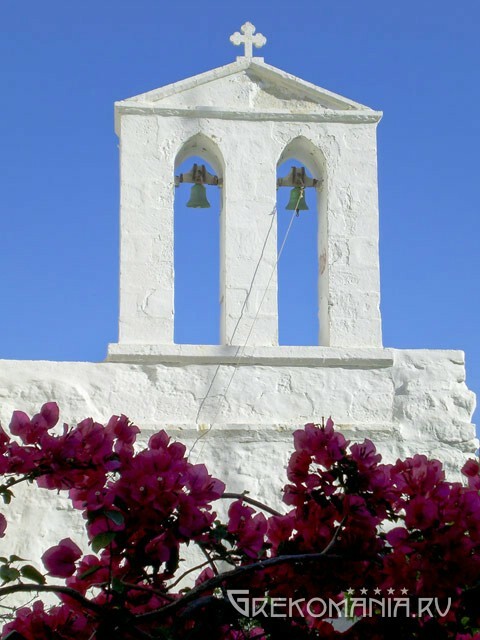 This tiny island is home to 80 churches and a local saint, Osia Methodia. It has a folk museum, an archeological museum, and a Venetian-era Castle. Saint Osia Methodia was born on the island in 1861. Her parents named her Irene. As a young bride she lost her husband at sea. She’d gained local fame for her modesty and piety, and after her husband’s death she felt that God was calling her to a lifetime of devotion. After a time of training, Irene was ordained a nun by Methodios, archbishop of Siros, and took the name Methodia. She spent the rest of her life monastically confined in a cell in the uninhabited inner castle of Kimolos, next door to the church of the Birth of the Lord, in the village of Horio. Her life of prayer, fasting, study, and charity was an inspiration to all who came in contact with her. She left her cell rarely, either to attend church or to help someone in need. God gave her the gift of healing, and she performed a number of documented miracles. She died at age 47, in 1908, and was later declared a saint, and patroness of Kimolos. The Kimoliotes are a little picky about their central population center being called Horio instead of the more common Hora, even though both words roughly translate as “village.” Historically there has only been one main settlement on the island, and that still holds true, with the port being a sort of extension of the village. Horio is close to the southwestern corner of the island. The population of the village, as in the rest of the island, predominates toward the more elderly, some of whom had emigrated elsewhere and then had chosen to live out their retirement years on the island of their birth. The village is divided by many smaller squares or platias, rather than having one large central square. 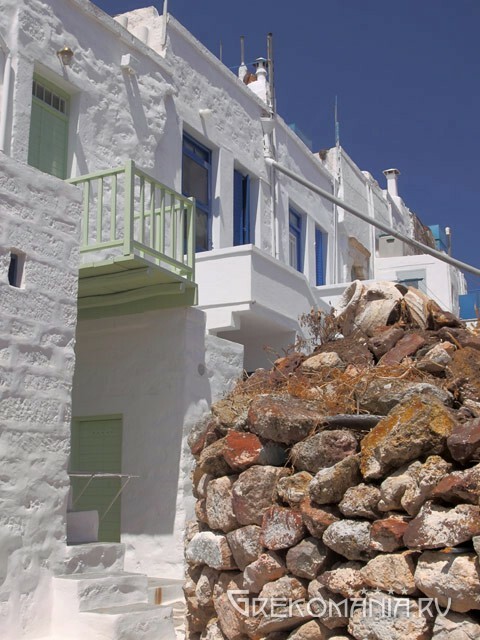 Horio, at an elevation of about 100m, and 600m northwest of the port at Psathi, has the narrow lanes typical of the Cycladic village. There are a number of abandoned houses, many of which are being restored by natives returning to the island. The place, you might think as you wander around it, has seen better days. Which is true, but with the increase in the tourist trade and the returning emigrants, things are slowly picking up. The village is built on the slopes of Mt. Xaplovouni, and is a bit spread out. It has 2 main sections; the older medieval section within the defensive walls of the Venetian Castle, built around the 15th century, and a newer section outside the castle walls. Most of the houses are built of sideropetra- “iron rock,” a hard durable, locally mined stone. The houses have limestone details and decorative elements. The houses were for the most part 2-story duplexes, each housing 2 families. There is an Inner and an Outer Castle. The Inner Castle is in poor repair, while the outward-facing walls of the houses in the Outer Castle are also the Castle’s defensive walls. There are two access gates to the Outer Castle, a lower and an upper gate. The Folklore and Maritime Museums are next to the upper gate, which is on the east side of the Outer Castle. The museum is in a former private residence. The first floor has a lot of common household items from previous generations, showing how a typical house was run before such things as electricity and indoor plumbing were common. Articles include hand looms, cobbler’s tools, agricultural and carpentry utensils, and lots of old kitchen utensils, and glass and pottery containers. There is an area with nautical memorabilia, miniatures of common sailing and fishing vessels, instruments, paintings, and diagrams of Greco-Turkish sea battles. 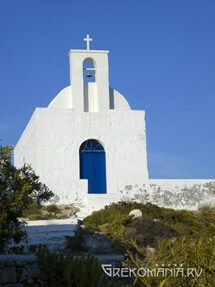 The most important church in Horio, and the island, is the metropolitan church of Panagia Odigtria, erected between 1867-1874 exclusively through the volunteer labor of the villagers. It is a magnificent, double-towered, single dome structure for which the Horiotes are justifiably proud. The church houses the Panagia Odigitria icon, dating from the 15th century, with origins either in Thessaloniki or Constantinople. It is also home to the remains of St. Osia Methodia, patroness of Kimolos, who, since she was born in 1861, was a little girl when they started building the church. Opposite the church is the Archeological Museum, which just opened in 2006. This white, rectangular, 2-story structure presents the history of the island, from the Late Stone Age up to modern times. There is a film loop of the history of Kimolos, which runs continuously. The floor is unique: it is made of thick, transparent plexiglass, and reveals the excavation of ancient graves below grade level. Museum artifacts include the 8th century, BC statue of a headless woman, other statuary, and facsimiles of pre-Christian documents. Most of the artifacts were uncovered in an area on the west coast of the island called Ellinika, a city that has been sunken into the shallow waters of the sea near the island of Agios Andreas. Birth of Christ (1592), the oldest one, in the Inner Venetian Castle. Chrisostomos (17th century), the former Metropolis, on the north of the Castle. Panagia of Oikonomos (17th century), west of the Castle. Taxiarches (17th century), southwest of the Castle. Chrisopigi (17th century), near the previous two churches. Sotira (Savior) (17th century), on the western side of the Castle. Agioi Anargiroi (17th century), opposite the Lower Gate of the Castle. Pantokratoras at Mt. Xaplovouni, with amazing view from its courtyard. For a round-ish island only 7km in diameter, there’s a lot of stuff to see. There are some nice windmills on the heights above Horio, and some mills elsewhere on the island. In the northwest part of the island is an extremely strange geological formation, known as the Skiadi. It’s in the middle of an otherwise barren plateau, and resembles a massive stone mushroom, with a narrow column, like a stone stalk, broadening out into a flared, mushroom cap-like top. Skiadi requires a certain level of fitness to reach, as it’s about a 35-minute walk from a drive-able road. It was formed by a geological phenomenon known as ablation, where dust carried by the high winds of the valley scratched and wore away the softer stone of the stalk, leaving the much harder rock of the cap intact. 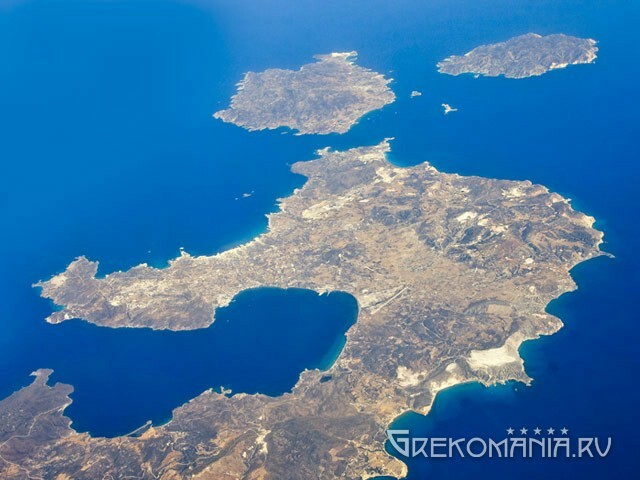 The view from the plateau takes in all of Kimolos, much of the surrounding sea, and nearby neighboring island Milos. Goupa, part of the Horio “metro” area, is a seaside fishing settlement which feature sea caves which have been used for centuries as boathouses for local fishermen. In the Ellinika area are the ruins of the sunken city in the shallow waters near the beach, along with ancient tombs dating from the Mycenaean up to Hellenistic times on the beach. You can hire a boat to visit the Carved Cave near Kakopotamos, accessible only from the sea. There is a hot spring at Agioklima beach, plus another cave at Gerakia, a rocky promontory. In the preserve on the northeast sector of the island, you can see the caves where the monk seals live from the promontory of Agios Georgios at the extreme northeast of the island. Kimolos has a number of very fine beaches. The downside is that they are mostly not organized, so you have to bring your own shade and food and drink, unless you’re near a settlement. The beaches near settlements are the most popular, anyway, and are found in and around near the port, Psathi. Other beaches can be gotten to by footpaths. The island is so small that you can walk to anywhere on it. Agios Georgios beach, by the aforementioned promontory on the northeast corner of the island, is long, sandy and beautiful. There are even a few places to rent nearby. Psathi beach is the port beach, and the island’s most popular, being next to the port. It’s partly organized, and a family friendly beach. It has some nice fish taverns nearby. The rest of the beaches are clustered on the south shore of Kimolos, south of Horio and Psathi. Aliki beach is a couple kilometers south of Psathi. It’s one of the most popular on the island despite its being un-organized. Ellinika, on the southwest part of the island, has nice water, and the ruins of that submerged city. It has pebbles and sand, and is un-organized. Other beaches on the south coast are Kalamitsi, Fikidia, and Dekas. Kimolos, with its mini-white cliffs of Dover, its caves and geological formations, its pristine beaches, and its hiking paths, is worth a stay if you are looking for a quiet place to pass your vacation.